Appropriate sedation and analgesia are essential components of care in the treatment of critically ill child in paediatric intensive care unit (ICU) especially those with mechanical ventilation. The main indications for sedation analgesia in ICU includes[2-4]. Most clinicians provide sedatives and analgesics according to their professional experience based on the patient’s estimated need for sedation without proper monitoring and frequent re-evaluation that may contribute to adverse outcomes and complications. Both under-sedation and over sedation have the potential to lead to agitated patients with compromised short-term safety issues and impact on duration of ventilation and length of stay (LOS)[6,7]. Contrary to earlier belief that as long as they were properly sedated, children in ICU were unaware of what was happening to them; new evidences are emerging that they, like adults, children can suffer from disturbing memories of their ICU course, which can affect their longer-term psychological recovery. The consequences of both under sedation and over-sedation are potentially amplified in the critically ill child in the paediatric ICU due to the developing brain. Unlike adult ICU, paediatric ICU admit patients with varying age and weight ranging from neonates to adolescent (depending on hospital and local policy). The physiology, pharmacology, assessment and monitoring of sedative-analgesic vary with age. As such, standard sedation scales do not necessarily apply, it is often difficult in small children to differentiate distress due to pain or other causes. In critically ill patients, it may be difficult to discriminate between pain, distress, iatrogenic withdrawal symptoms and delirium especially in paediatric age group, as the behavioural cues will overlap in part. 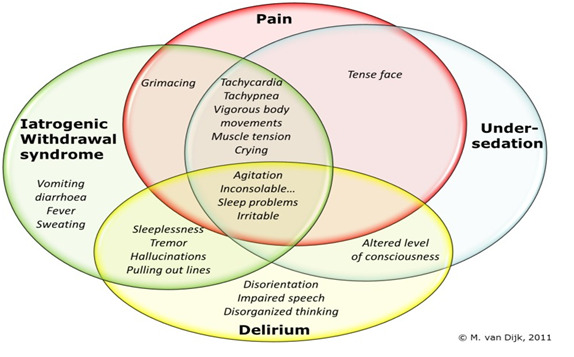 Figure 1: Overlap of behavioural cues in pain, sedation, withdrawal syndrome and delirium. Identify the cause of distress: One should try to find out the cause of the distress and address the root cause. Common causes of distress in critically ill child include anxiety, pain, dyspnea, delirium, iatrogenic withdrawal syndrome and neuromuscular paralysis, these factors may occur separately or in combination. Anxiety: Unfamiliar atmosphere, stranger anxiety and separation from parents are the common causes of anxiety in smaller child. In older child, fear of suffering, fear of death, loss of control and frustration due to the inability to effectively communicate are typical causes of anxiety in ICU. Anxiety can manifest as agitation, tachycardia, sweating, dry mouth, hyperventilation, pallor, tremulousness and or hyper-vigilance. Pain: There can be many cause of physical pain in ICU, either due to disease process (trauma, postoperative) or iatrogenic or procedure related such as suctioning, endotracheal tube, invasive lines, immobility. Delirium: It is an acute and potentially reversible impairment of cognitive and consciousness that often fluctuate in severity that can’t be better accounted for by another pre-existing neurocognitive disorder. Delirium has been described in infant below one year of age as well. Delirium symptoms are similar in adults and children, and may show slowed or sparse voice, slowed motor activity and lethargy in hypoactive type or aggressive, agitated, restless in hyperactive type. There is growing evidence of positive association between illness severity and paediatric delirium[14,15]. Iatrogenic withdrawal syndrome (IWS): Prolonged administration of sedative-analgesic particularly opioid and benzodiazepine may induced drug tolerance and physiological dependency. Abrupt tapering or discontinuation of these medications may precipitate IWS. The onset of IWS can be one to 48 hours after stopping or tapering off and have been reported as high as 57% of paediatric ICU who received opioid and /or benzodiazepine for more than five days. Nonpharmacological strategies: Non-pharmacologic strategy should be complementary as they act as an adjunct to pharmacological agents, reduces the requirement of pharmacologic agent. It should be initiated alongside the introduction of pharmacological interventions. Non-pharmacological interventions include reassurance, good environment (light, noise, smell), frequent communication with the patient, regular family visits, establishment of normal sleep cycles and cognitive-behavioural therapies, such as music therapy; guided imagery and relaxation therapy[9,17]. Pharmacologic intervention: The sedation in ICU can be best described in three phase, initiation, maintenance and weaning phase. The goal and approach vary from patient to patient, response to interventions and clinical conditions. Loading dose are given during initiation phase to achieve the desired analgesia and sedation goal, followed by maintenance infusion with regular reassessment and adjustment of therapy to maintain these goals and finally when the clinical condition improved, escalation or weaning of sedation done in stepwise manner. Initiation and selection of agent: Adequate Analgesia should be provided to all critically ill-children regardless of the need for sedation. Multimodal analgesia in the form combination of local and regional anaesthetic techniques, non-opioid analgesic and opioid analgesics can be chosen depending on the pathophysiology of pain. For older children, patient’s controlled analgesia (PCA) device may be useful. Agent such as paracetamol, non-steroidal anti-inflammatory drugs (NSAIDs) and antiepileptics can be used as adjunctive therapy when indicated (postoperative or trauma patients). There is no ideal agent that fit for all patients and the optimal agents for short or long term sedation is still unknown. Aetiology of the distress and choice of initial pharmacological intervention is shown in (table 1). Another important factor in deciding the agent is consideration of pharmacokinetic modifying variable, such as age, duration of action, general condition and haemodynamics, hepatic and renal functionand the desired degree of sedation, etc[7,9,10]. Table 1: Aetiology of distress and choice of sedative-analgesic in Paediatric ICU. Sedation and analgesia Goal: The ideal sedative-analgesic goal is for the patient to be awake and comfortable with minimal to no distress, however, some patients may require deeper level of sedation for optimal management (eg. patients on ventilator; head injury, ARDS). Scoring system has been designed to make evaluation for pain, depth of sedation and delirium assessment. The scoring systems are more useful during the maintenance of sedative-analgesic therapy. Assessment of pain: Routine pain assessment in systemic way using standardized, validated measure is considered as the foundation of effective pain management for any patient, regardless of age, condition or setting. Children as young as three years can self report the pain. Whenever possible children self-report of pain is the preferred method and should be attempted. Behavioural clues to pain, anxiety or other distress are often difficult to differentiate in paediatric age group. Wide variety of methods exist for evaluation of pain in non-communicative infants and children, none of these measures has been uniformly accepted. Most of the available paediatric pain assessment instruments are multidimensional, which incorporate both behavioural (facial expression, body movement, cry) and physiological indicators (heart rate, respiratory rate, blood pressure, saturation). Table 2: Commonly used pain scoring system in paediatric patients. 0-7 years Evaluate 5 point (0-2 score) age-appropiate behavioral and physiological factors; Facial expression, Leg movement, Activity, Cry and Consolability. It is widely used scoring system, but is non-specific. Above 3 years Simple scoring tool used for pain discrimination, self-report faces scale for acute pain. Six line-drawn faces range from no pain to worst pain with assigned numerical value and word description (no hurt, hurt little, hurt a bit, hurt a whole lot etc) to each face. Sedation assessment in Paediatric ICU: Proper assessment of adequate sedation should be used concomitantly with routine pain assessment. Sedation in ICU is a dynamic process; sedative dose should be titrated to fluctuating level of sedation which is stimulus dependent. The degree of sedation requirement varies from patient to patient according to the underlying clinical condition and nature of required therapeutic, invasive or investigative procedures. Many paediatric ICU is until using either adult sedation scale (Ramsay, Richmond sedation score) or scales not specifically designated to evaluate sedation (eg FLACSS scale) to assess the sedation in paediatric age group. Only few clinical scoring systems have been validated for assessing the level of sedation in paediatric ICU patients. Table 3: Common paediatric sedation assessment scoring systems. 6 week to 6 years Six-dimension scoring tools (-3 to +2 scoring system based on patient’s response to voice then touch and then noxious stimuli) derived from state/ behavioural dimension and numeric rating scale. Validated in paediatric patients, useful in non-paralysed ventilated patient also. Children younger than 18 years Six-item scoring tool (level 1-6) that defined target goals of sedation related to the amount of ventilator support required. Used for sedated/paralysed mechanically ventilated patients. Children younger than 18 years The most extensively used and validated tool. Comfort scale has eight domains and includes physiological variable heart rate and blood pressure and does not include crying where as comfort behavioural scale uses 7 domains with Consciousness, agitation, respiratory response, crying, physical movement, muscle tone and facial tone as measurable elements. Can be used in sedated non-paralysed ventilated patient also. 1 month to 5 years Five-domain scoring tool that assesses motor response, mimic ability, eye opening, ventilation tolerance and reaction to painful measures. The best evaluated and validated clinical score system are the COMFORT and COMFORT-behaviour scale, which are also used to assess both pain and sedation. However, these are not useful for patients on mechanically ventilation with neuromuscular blocker. Neurophysiological monitoring: Children who are mechanically ventilated and pharmacologically paralysed, monitoring of depth of sedation, level of pain and presence of delirium is challenging. In this subgroup of patients, neurophysiological monitoring technique such as bispectral index (BIS) or auditory-evoked potentials can be utilised. BIS monitoring uses electroencephalographic (EEG) signals and analysed these signals through a complex Fourier transformation to give a numerical value ranging from 0 to 100, where 0 is no neurological activity and 100 is fully awake patient. These electophysiological monitoring are primarily used in operative room anaesthesia to monitor the depth of anaesthesia in patients without underlying neurological disease. BIS monitoring is not routinely used in ICU as there are conflicting reports regarding its benefit and electromyelographic activity from the scalp muscle creates artefact. Number of studies has compared and validated the usefulness of BIS monitoring in paediatric ICU in mechanically ventilated and paralysed patients. However, BIS monitoring should not replace the routine clinical assessment of sedation; rather it can be used in selected patients (intubated and paralysed) as complimentary to clinical assessment. Drug and dosing: The choice of drug and dosing depends on many factors like indication of sedative analgesia, patient clinical status, patient on mechanical ventilation and expected duration of sedation. Commonly used sedative-analgesic in paediatric ICU are shown in (table 4). Table 4: Dosing of commonly used analgesic and sedative. Infusion: 0.01-0.05mg/kg/hr 5-10 min Sedative and analgesics for long term mechanical ventilation; acute and chronic painful procedure. Require Dose reduction in renal failure, may cause histamine release. infusion-1010 mcg/kg/min 2-5 min May cause initial hypotension on bolus dose. Short acting but behave as long acting on prolonged infusion. Tolerance and withdrawal syndrome common. Implicated main agent causing delirium in ICU. Dose adjustment in renal and hepatic function. Iv: loading dose 0.02-0.06 mg/kg. Infusion: 0.02-0.1 mg/kg/hr 5-20 min Longer acting benzodiazepine, action similar to midazolam. limited clinical experience in paediatric ICU. infusion: 0.5-3 mg/kg/hr 1-2 min Ultrashort acting sedative hypnotic with rapid recovery, may cause hypotension initially, prolonged infusion may lead to propofol infusion syndrome. infusion-0.7-3 mg/kg/hr 1-2 min Strong analgesic and sedative, reduces opioid requirements, may cause hypertension, increased in intracranial pressure, emergence delirium and can accumulate in hepatic failure. infusion: 1-5 mg/kg/hr 30 sec Not ideal for prolong use in ICU, may have a role in refractory status epilepticus. Loosing the popularity because of propofol. 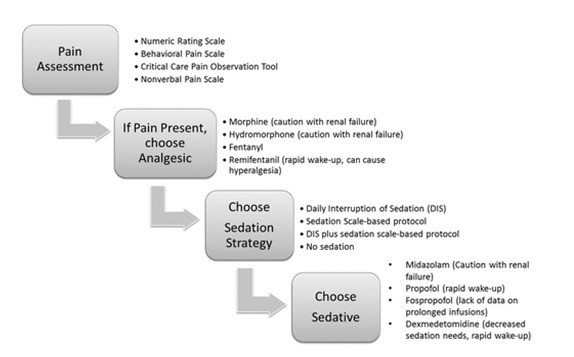 Stepwise approach of Analgesia and sedation algorithm: A systematic approach to an analgesia and sedation strategy is vital to address patient needs while preserving the ability to assess for improvement in neurological and respiratory status. A specific pain assessment tool should be used to identify pain and titrate analgesic medications. A specific sedation strategy should be chosen, and if a sedative is needed, the choice should be based on a careful weighing of sedative effect, duration of action, and other patient-specific factors such as renal failure. Importantly, the pain and sedative needs should be reassessed frequently to develop an optimal strategy for a particular patient[20,21]. • Intermittent small bolus doses without increasing the basal infusion rate. • Daily interruption of sedation until the child is awake and following instruction or until the patient is uncomfortable or agitated, and deemed to require the resumption of sedation. • Sedation Holidays or sedation vacation: Similar to daily interruption of sedative-analgesic, but instead of daily affair it is done on periodic way to evaluate the sedation and emergence. • Autonomic features: vomiting, tachycardia, hypertension, fever. • Cardiovascular: tachycardia, hypertension, arrhythmias. Commonly used strategies to reduce the withdrawal syndrome start with efforts to reduce the total doses of benzodiazepine and opioids administered in paediatric ICU by using appropriate assessment scale and greater use of non-pharmacological intervention to reduce pharmacological sedation. • Rate of reduction sedative/ analgesic should be individualised based on indication of sedation, duration of sedation. • Analgesia first followed by sedation is the norm when we start sedation in ICU. The reverse is applicable in weaning process; sedation is tapper first and then analgesia so that the child does not awake in pain. • Abrupt discontinuation: acceptable if the sedative-analgesic agents have been administered for a short duration (less than 5 days). It may also be appropriate in patients who have received sedative-analgesic for an extended period and are deeply sedated from prolonged accumulation of medication. • Gradual withdrawal: A gradual reduction of 10 - 25% per day may be most appropriate strategy for patients who have received more than 7 days of sedation and exhibits evidence of tachyphylaxis with increasing dosage required over time to achieve the same level of sedation. • Switching one drug from another to prevent the development of tolerance and accumulation of one particular group of medications. Best example is of intravenous dexmedetomidine to facilitate opioid and benzodiazepine withdrawal[24,25]. Non-pharmacologic interventions are essential and often complementary to pharmacologic sedative analgesics and should be considered irrespective of need for pharmacologic therapy. Individualised institutional protocolised based guideline emphasising Analgesic first regime is the standard technique for effective and safe use of sedative analgesics in paediatric intensive care unit. 1. Tobias, J.D. Tolerance, withdrawal, and physical dependency after long-term sedation and analgesia of children in pediatric intensive care unit. (2000) Crit Care Med 28(6): 2122-2132. 2. Bavdekar, S.B., Mahajan, M.D., Chandu, K.V. Analgesia and sedation in paediatric intensive care unit. (1999) J Postgrad Med 45(3): 95-102. 3. Mehta, S., McCullagh, I., Burry, L. Current sedation practices: lessons learned from international surveys. (2009) Crit Care Clin 25(3): 471–488. 4. Playfor, S.D., Thomas, D.A., Choonara, I. Sedation and neuromuscular blockade in paediatric intensive care: a review of current practice in the UK. (2003) Paediatr Anaesth 13(2):147–151. 5. Selbst, S.M. Adverse sedation events in pediatrics: a critical incident analysis of contributing factors. Pediatrics 105(4): 864-865. 6. Aitken, L.M., Bucknall, T., Kent, K., et al. Protocol directed sedation versus non-protocol directed sedation to reduce duration of mechanical ventilation in mechanically ventilated intensive care patients. (2012) Cochrane Database Syst Rev (4): CD009771. 7. Vet, N.J., Ista, E., de Wildt, S.N., et al. Optimal sedation in pediatric intensive care patients: a systematic review. (2013) Intensive Care Med 39(9): 1524–1534. 8. Loepke, A.W. Developmental neurotoxicity of sedatives and anesthetics: a concern for neonatal and pediatric critical care medicine? (2010) Pediatr Crit Care Med 11(2): 217–226. 9. Playfor, S., Jenkins, I., Boyles, C., et al. Consensus guidelines on sedation and analgesia in critically ill children. (2006) Intensive Care Med 32(8): 1125–1136. 10. Mason, K.P. Challenges in paediatric procedural sedation: political, economic, and clinical aspects. (2014) Br J Anaesth 113 (suppl 2): ii48-ii62. 11. Harris, J., Ramelet, A.S., van Dijk, M., et al. Clinical recommendations for pain, sedation, withdrawal and delirium assessment in critically ill infants and children: an ESPNIC position statement for healthcare professionals. (2016) Intensive Care Med 42(6): 972–986. 12. American Psychiatric Association. Diagnostic and statistical manual of mental disorders, fifth edition (DSM-5) Washington, DC. (2013). 13. Silver, G.H., Kearney, J.A., Kutko, M.C., et al. Infant delirium in pediatric critical care settings. (2010) Am J Psychiatry 167(10): 1172–1177. 14. Silver, G., Traube, C., Gerber, L.M., et al. Pediatric delirium and associated risk factors: a single-center prospective observational study. (2015) Pediatr Crit Care Med 16(4): 303–309. 15. Schieveld, J.N., Leroy, P.L., van Os, J., et al. Pediatric delirium in critical illness: phenomenology, clinical correlates and treatment response in 40 cases in the pediatric intensive care unit. Intensive Care (2007) Med 33(6): 1033-1040. 16. Katz, R., Kelly, H.W., His, A. Prospective study on the occurrence of withdrawal in critically ill children who receive fentanyl by continuous infusion. (1994) Crit Care Med 22(5): 763–767. 17. Fontaine, D.K. Non pharmacologic management of patient distress during mechanical ventilation. (1994) Crit Care Clin 10(4): 695-708. 18. Keogh, S.J., long, D.A., Horn, D.H. Practice guidelines for sedation and analgesia management of critically ill children: a pilot study evaluating guideline impact and feasibility in the PICU. (2015) BMJ Open 5(3): e006428. 19. Franck, L.S., Bruce, E. Putting pain assessment into practice: Why is it so painful? (2009) Pain Res Manag 14(1): 13-20. 20. Shruti, B.P., John, P.K. "Sedation and Analgesia in the Mechanically Ventilated Patient". (2012) Am J Respir Crit Care Med 185(5): 486-497. 21. Wiatrowski, R., Norton, C., Giffen, D. Analgosedation: Improving patient Outcomes in ICU Sedation and Pain Management. (2016) Pain Manag Nurs 17(3): 204-217. 22. Kollef MH, Levy NT, Ahrens TS, et al. The use of continuous i.v. sedation is associated with prolongation of mechanical ventilation. (1998) Chest 114(2): 541-548. 23. Playfor, S.D. Analgesia and sedation in critically ill children. (2008) Contin Educ Anaesth Crit Care Pain 8(3): 90-94. 24. Maccioli, G.A. Dexmedetomidine to facilitate drug withdrawal. (2003) Anesthesiology 98: 575-577. 25. Multz, A.S. Prolonged dexmedetomidine infusion as an adjunct in treating sedation-induced withdrawal. (2003) Anesth Analg 96(4): 1054-1054.